Growing begonia indoors is easy. All you actually need is some space and a bright window. Of course, you also need some knowledge in order to keep the houseplants at their best. So if you need a new houseplant to add to your growing collection, or perhaps you want a new plant to grow in your hanging baskets, here are some tips when it comes to growing begonia indoors. First of all, select the variety of begonias to grow. There are two basic types of begonias – one is grown from seed and another is grown from bulbs or tubers. Choose the bulbs if this will be the first time you are growing this plant. Growing the begonias from seeds is a bit difficult since it is smaller. On the other hand, begonia bulbs are larger and sturdier. Since you are growing begonias in containers indoors, then you should choose the indoor variety. Indoor varieties can be grown in both seeds and bulbs. They are also available in different colors and varieties. Begonias are annuals, however the bulbs can be possibly saved and replanted at a later time. Visit your local nursery to buy a potted begonia for transplant if you do not want to grow it from seeds or bulbs. Otherwise, proceed to the next step if you’re growing begonias from bulbs. Begonias will be able to grow better in a soil-free garden mix than in a typical dirt soil. Therefore, before you start growing begonia indoors, prepare a mixture of 1/3 of soil-free potting mix and 2/3 peat moss mixtures. Choose the potting material that is slightly acidic or relatively neutral in the pH scale. Begonias love acidic and well-draining environment and this is what the peat moss mixture can provide. Soak the peat moss mixture in boiling water. Afterwards, leave it to cool for a few minutes. Only then you can start planting the begonia bulbs. When growing begonias in containers, use the container that is only slightly bigger than the Begonia root ball. Be careful with using an extremely huge container since too much soil could get soggy and might end up drowning the roots of the plants, thereby killing your begonias. Intermix them in an ample sized pot or container if you want to. Otherwise, plant them along with other plants in a pot. Remember that begonias do not really need a lot of space. Plant them in a container along with other houseplants if you wish. Place the peat moss mixture into the container that you will use to grow begonia. Dig a hole in the middle just enough for the bulb to fit in. Place the begonia bulb in the hole you have dug. Allocate a hole on each and every bulb. You can plant them close to each other if you wish. Cover the bulb with only a few inches of the soil and potting mixture. Break the bulbs a bit before planting if you are growing small begonias in containers. Proper location is a must when growing begonias in containers. Place the plant in a place that is bright and receives indirect sunlight. Consider growing your begonia beside a window. Avoid placing them on the southern windows during the months of February until September since too much light will be getting inside during these months. Hang thin curtains if necessary. Filter the light that comes from the western and eastern windows if they are facing water or concrete. If you are using grow lights to grow begonia indoors, place the light about 12 inches above the plant. Leave the grow lights on for up to 12 hours each day. Keep the indoor temperature warm since the plants cannot handle cold too well and they end up wilting on lower temperatures. Set the plant in a shallow tray that’s filled with water and pebbles if the air inside your house is dry. This is especially applicable during the winter. Allow the plant to get enough humidity, which is needed for them to thrive indoors. After only a few weeks, you’ll notice your begonia plants will start growing. Water the plant regularly. Begonias will need a bit of extra watering right after they are planted. Thus, one of the most important indoor begonia care tips is to make sure you water it regularly. Give it heavy watering so that the soil will remain moist but not drenched. Regardless of the types of begonias you are growing, the flowers must be watered after every few days. It is best to use distilled water for watering the plants. Use a sprinkler if you need to. Keep in mind that begonias do not tolerate heavy watering well so avoid overwatering the plant. Water the plant from the base instead of pouring water directly into the leaves. Water just below the leaves to avoid attracting fungal diseases on the leaves. Above all, empty the drained water that has accumulated at the saucers and trays of the container. To ensure successful growth, you need to learn how to care for begonias. One of the most important indoor begonia care tips is to deadhead the flowers. Eventually, you will notice that the flowers of your begonia plant will start to turn brown and will soon die. This is when you need to apply deadheading. To do this, cut and pull all the heads of the dead flowers to encourage new growth and to divert the nutrients to some other parts of the plants. Remove all dead buds at the end of the begonia’s blooming season. Leave the green leaves behind. This way, the nutrients that the plants have gathered will get stored at the bulb for the next season of growing, instead of helping those flower bulbs that already died. Aside from removing dead flowers, you also need to trim off the broken stems and dead leaves in order to promote new growth. Dust off the leaves if needed. 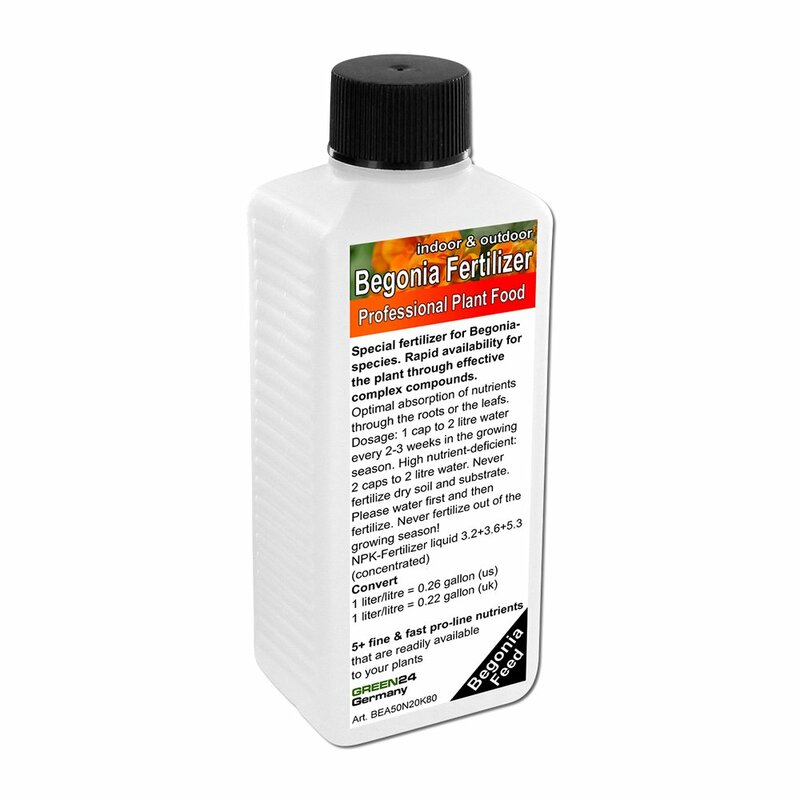 Fertilize your begonias with a fertilizer that is high in phosphorus and is water-soluble. Do this once each month from February until September. Fertilize the plants less frequently starting the fall season until the winter months, since the plant will not grow steadily during these months. Prepare the fertilizer in accordance to the direction that’s stated on the label. Wait for three months before you fertilize if the potting mix you have used already contains fertilizer. Be mindful of pests since indoor begonias are naturally pest resistant. Keep their leaves dry at all times since indoor begonias are highly susceptible to fungus diseases such as mildew. You may need to use pesticides when this happens. •	Skip the seeds – as mentioned above, seeds are a bit difficult to grow. Therefore, use the bulbs instead when it comes to growing begonias. •	Provide afternoon shade – observe the sun patterns in your garden. That way, you can grow the begonias in an area that’s capable of receiving plenty of afternoon shade. •	Keep the soil most – begonias love moist soil. Therefore, it’s highly advised that you mist the soil using a spray in between feedings. However, be very careful not to saturate the soil because this could lead to disease and rot on the roots. •	Feed the plants often – begonias are able to respond well on fertilizer, most especially after the first planting. Feed the begonia once after you plant and then continue with weekly feedings at the first few weeks of growth. •	Deadhead often – deadhead the plants as often as you can. The dead blooms could kill your plants if you leave them longer. Growing begonia indoors is a great way to fill your home with lots of colors. With the right place and with a little bit of care and attention, your begonia houseplants should be able to flourish indoors.